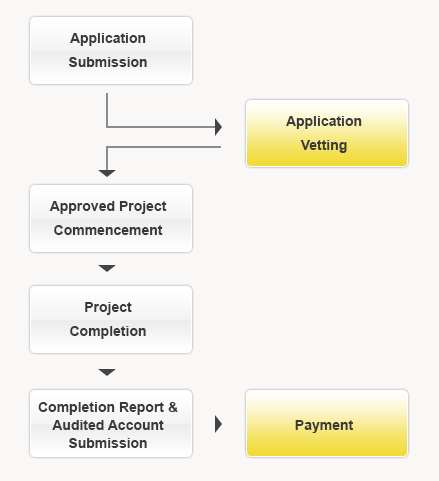 Enterprise should submit a completed ReTAAS application form with the required supporting documents, to the Secretariat by post, email or in person. A list of potential providers is at http://www.itsolution.org.hk/index.asp?a=1&clang=eng and Grantees’Selected Vendors for reference. For the avoidance of conflict of interest in engaging service provider(s) /consultant(s) /contractors(s) for implementing the projects, the applicant must not engage service providers /consultants /contractors which their owners, shareholders, management are the owners, shareholders, management or their relatives of the grantee enterprise. *The above lists do not include all service providers. Applicants can choose any suitable service providers. The use of the above service providers will not guarantee successful application. The Secretariat of ReTAAS has not appointed or endorsed any companies or organizations to provide services in relation to ReTAAS and all applications will be considered by the ReTAAS Vetting Committee based on its own merits.